​If you have been to a mineral show, you know that mineral specimens can be very expensive. Some of you have gone out to dig for your own specimens. Whether you are building your mineral collection by buying specimens, finding them yourself or a little of both, you know that your specimens are valuable. 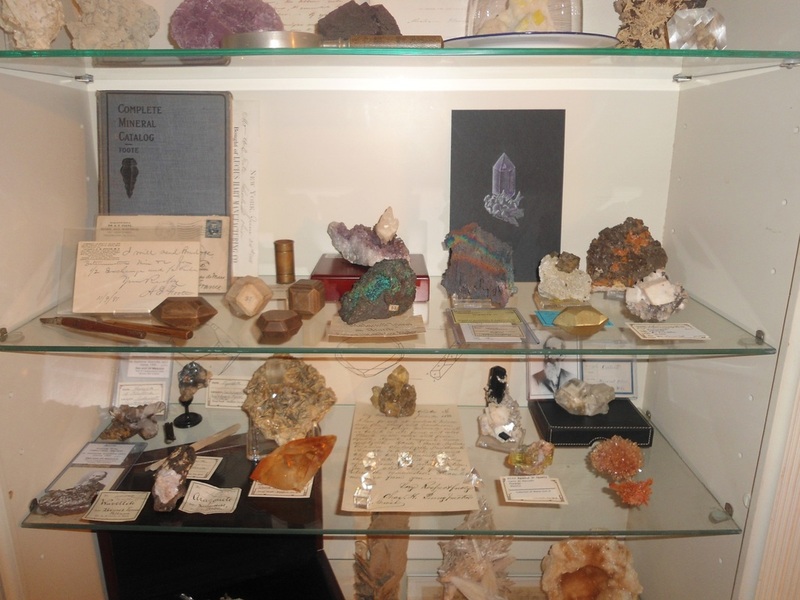 You can’t believe how many collections have bunches of mineral specimens piled on shelves or on top of desks. The specimens collect dust, are bumped around and are often damaged. One of the most upsetting experiences of collecting is to have a special, prized specimen broken or damaged. Right away it is worth much less. Also, it looks a lot worse than it did before. Your collection can be carefully kept, and will be more valuable, if you do the following three steps every time you get a new specimen. 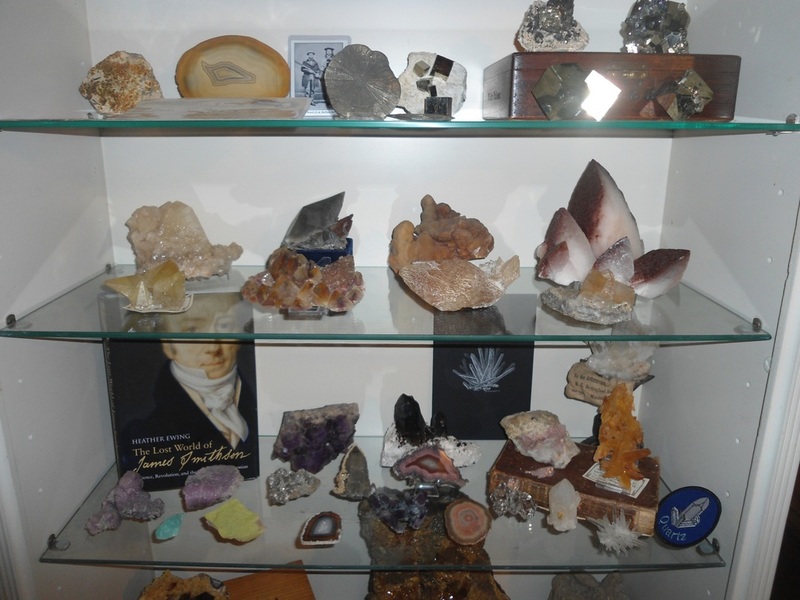 A bunch of minerals becomes a true mineral collection when you take care of it, store your specimens properly, number, record and label your specimens. ​Then you have a real collection. Always keep your specimens safe so they don’t get chipped or broken. If you place your specimens on a table top or shelf, or in a drawer, they will easily be bumped into each other and will eventually get chipped and damaged. What can you use? Here are a few ideas. You and your family can think of more. 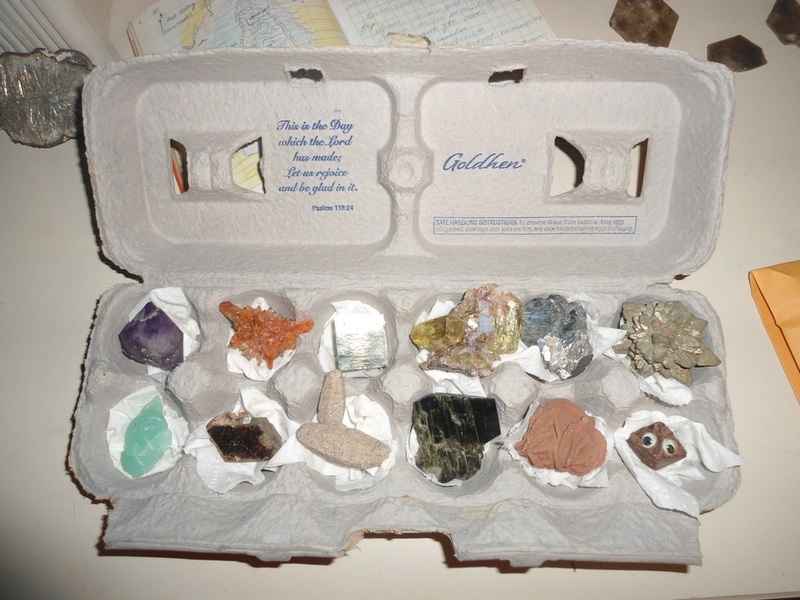 If you choose to use egg cartons, you can do the following . . .Step 1: Decorate your egg carton with pictures from mineral magazines. Write your name on your egg carton. Step 2: Put a small amount of cotton in each of the 12 egg spaces or place a piece of cotton batting cut to size on the bottom of your box. This is to give extra protection to your specimens. ption 2: Small boxes (like shoe boxes or cigar boxes). If you use a box, put in dividers so your specimens don’t bump into each other. Option 3: A plastic hardware storage box with drawers. These are not too expensive and come with dividers for the drawers. You can get them with drawers that are all the same size or some are made with drawers that have different depths. Option 4: A shelf. You can display your specimens on a shelf in your room. This is a challenging option, though. On a shelf, people may pick the minerals up to look at them, they may be dropped, they can easily be pushed into each other. They will also get dusty and it can be challenging to clean some mineral species without damaging them. If you like the idea of display shelves, perhaps you can find an actual display cabinet that has a glass front to it. Curio cabinets are sold at most furniture stores and can be very reasonable in price (often under $100). These display/curio cabinets often come with lights. It’s always cool to see your best specimens safely in a cabinet and properly lit up! Option 5: Buy an old chest of drawers at a yard or rummage sale. 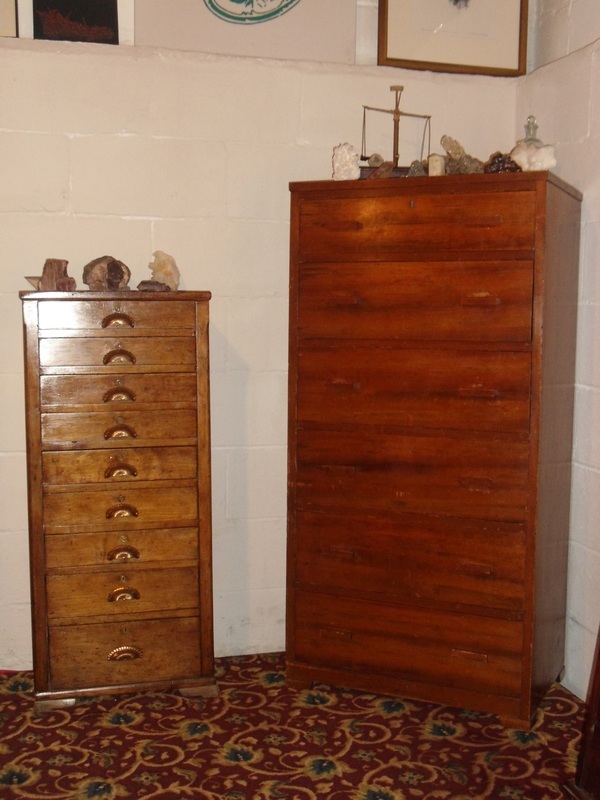 An old chest of drawers can be easily converted into a storage cabinet for specimens. Before you decide which kind of cabinet would be best for your collection, take a look at the specimens you have. How big are they? 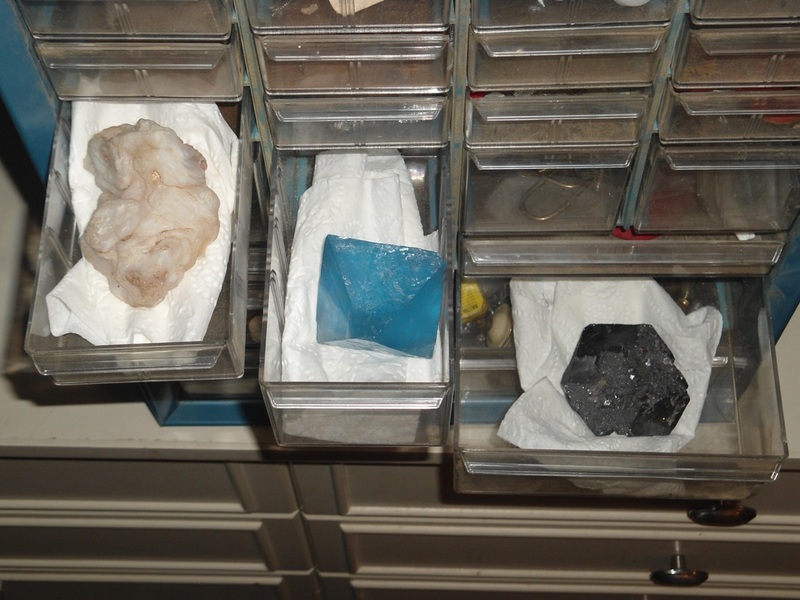 Large, cabinet size specimens will need large, deep drawers, 6 to 10 inches or more. The depth is important because you don’t want the top of your specimens to get caught on the frame of the cabinet when you close the drawer! I have seen some collectors very carefully tip specimens so that the drawer would close only to find that the drawer would not open again because the specimen is sticking up and catching on the frame or the drawer above! Choose drawers that are deep enough to allow 1/2 inch or more clearance. Small specimens can be stored in just about any dresser drawer with room to spare. When you have chosen a dresser or chest of drawers for your collection, you can paint it or decorate it with pictures from mineral magazines. 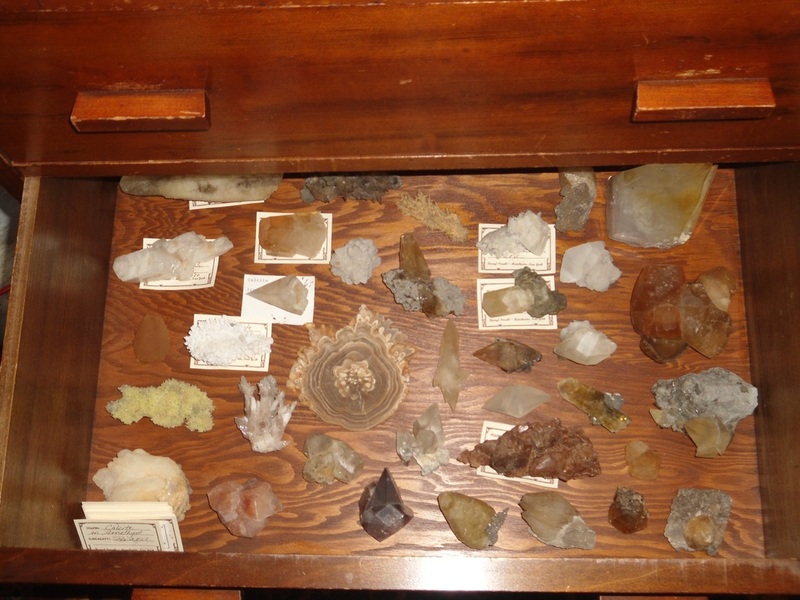 Create a collage all over the dresser with pictures of minerals and crystals. Glue the pictures into place with white glue. When the glue has dried, paint polyurethane or varnish over the pictures. Give two or three coats. Let each coat dry completely before applying the next coat. This will give you a hard, shiny surface over the pictures. When you put your specimens in the drawers, place them in cardboard trays (the tops to the white specimen boxes you see at shows work really well). This will keep them from bumping into each other. I have chosen to line the bottom and sides of my cabinets with a layer of soft foam which I covered with dark blue fabric. I then glued this to the bottom of the drawer. The specimens sit on the fabric without moving when I carefully close and open the drawers. 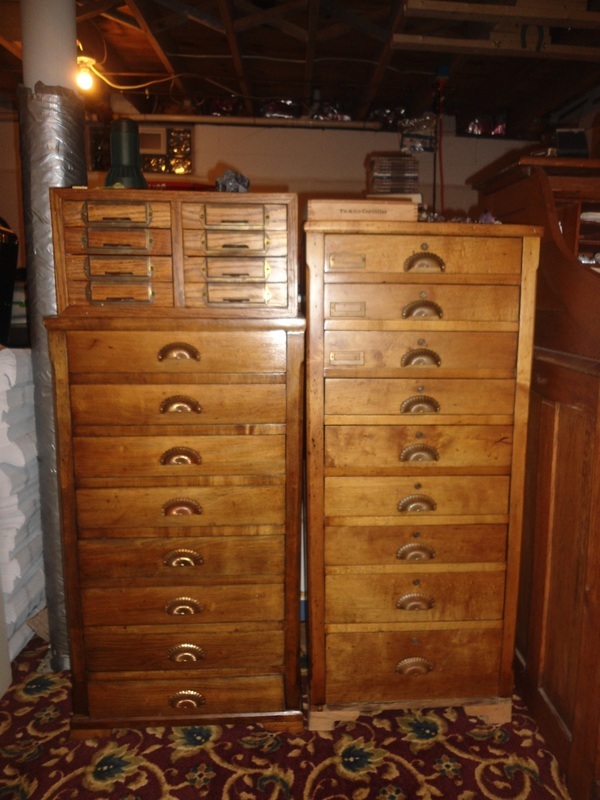 With some creativity, a collector can transform any old dresser into a nice storage cabinet with a variety of custom-prepared drawers made specifically for your specimens. And remember, be patient. Make it a family project to visit yard sales and wait until you find the cabinet that is just right for your collection. “Just right” will be the right size and the right price for you. It is very important to put numbers on your specimens and keep a list. This is to help you remember what you have. It also helps visitors know what you have in your collection. It can be done, very simply, in a couple ways. Step 1: Write small numbers on a piece of white paper. Better yet, type out numbers on your computer in an easy to read font like Times New Roman, and use a very small font size. 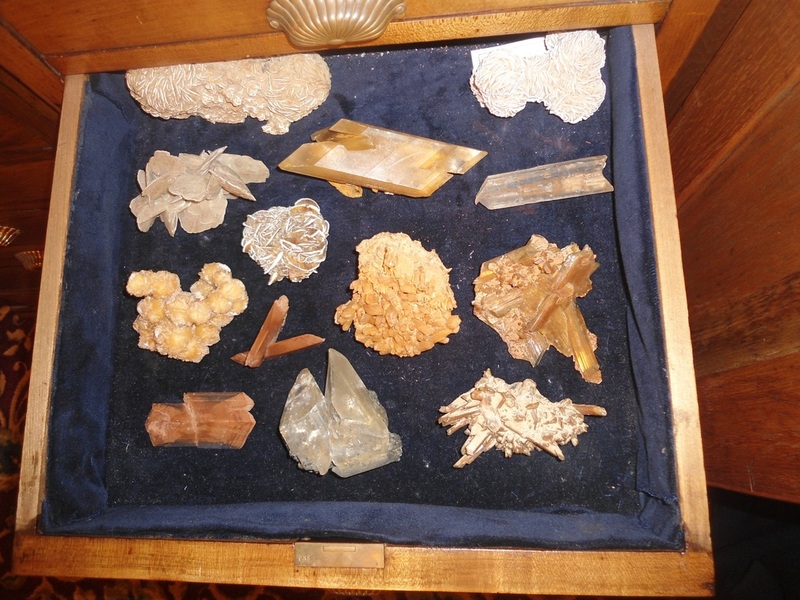 For most mineral specimens, 8 is recommended. Step 2: Carefully cut out the number “1” and glue it to the mineral specimen. Always apply a number on a part of the specimen that will not be seen, such as on the bottom of the specimen or on the back. Also, do not apply it to a crystal but rather to the matrix. If your specimen does not have matrix, find the least visible spot where it will not be easily noticed. Step 4: Repeat steps 1-3 for all of the specimens in your collection. It is always important to have labels for your specimens, especially if you are displaying them on a shelf, table or desk. However, make labels even if you keep your specimens in a box. Here are pictures of some professional mineral labels. Use them to inspire your own label style. Using a computer and printer, you can make as many labels as you wish. They can be any size that you like, they can have pictures on them, and they can even include your own name. To the left are a number of labels from a private collection to show you just some of the possibilities. Notice that every label includes the name of the mineral. Every label also includes the locality. “Locality” is the place where a mineral was found. The size of the label is up to you. Obviously some people like large, easy-to-read labels. Some, like the tiny one in the upper right corner on the previous page, is very tiny and was written by hand. Some people like plain white paper. Some like colored paper. Speaking of paper, labels are usually printed on slightly heavier paper so that they can hold up better than typical printer paper. Place the label with the specimen in your cabinet. Mineral labels are collector’s items themselves. Usually a label is designed to be reasonably small and simple so that it doesn’t take your attention away from the specimen. But, mineral collectors can be creative people and sometimes they like to have catchy labels. You can download a single sheet of label styles by clicking the "Download File" to the right. 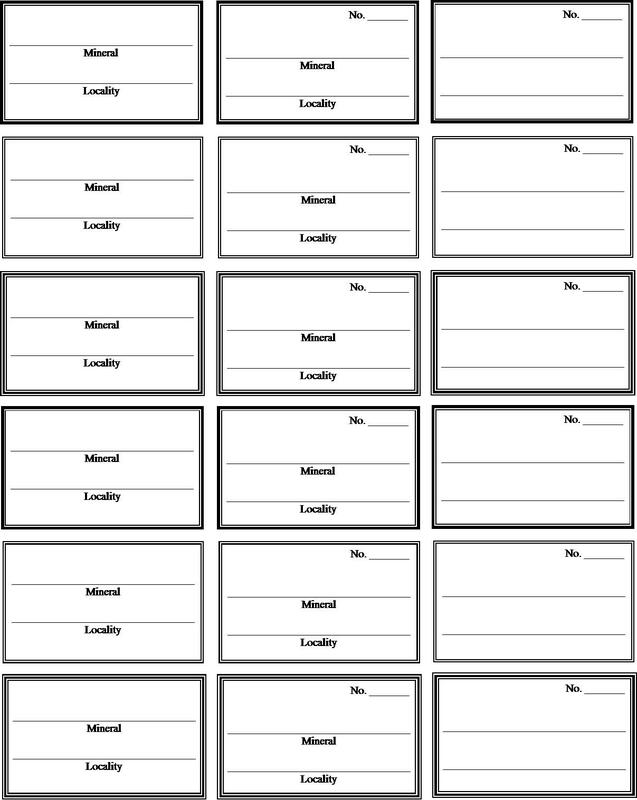 If you like one of the styles, use a word processing program to create an entire sheet and print all that you need! 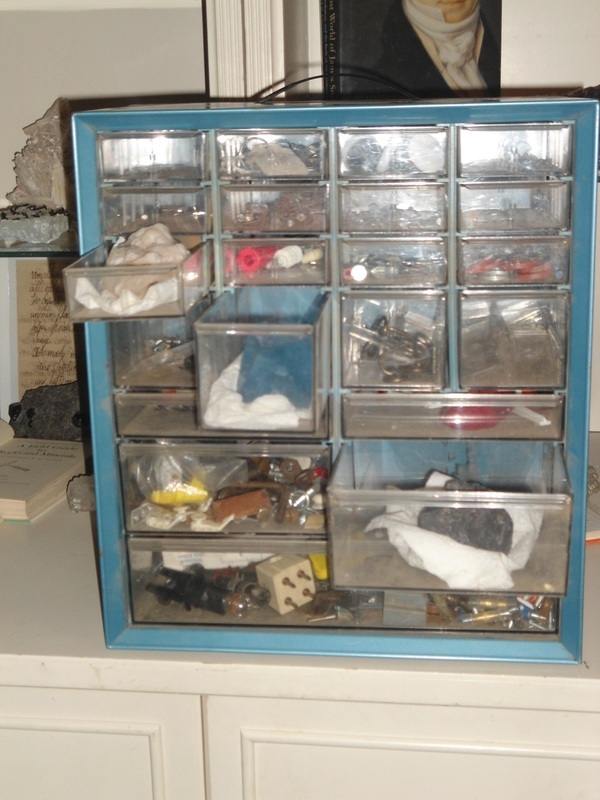 The aspect in which most mineral collections are weak is record keeping. Having a specimen and even carefully putting it in a cabinet or on display is only a job half-done! The other half of the job is the preservation of as much information about the specimen as you can possibly find. 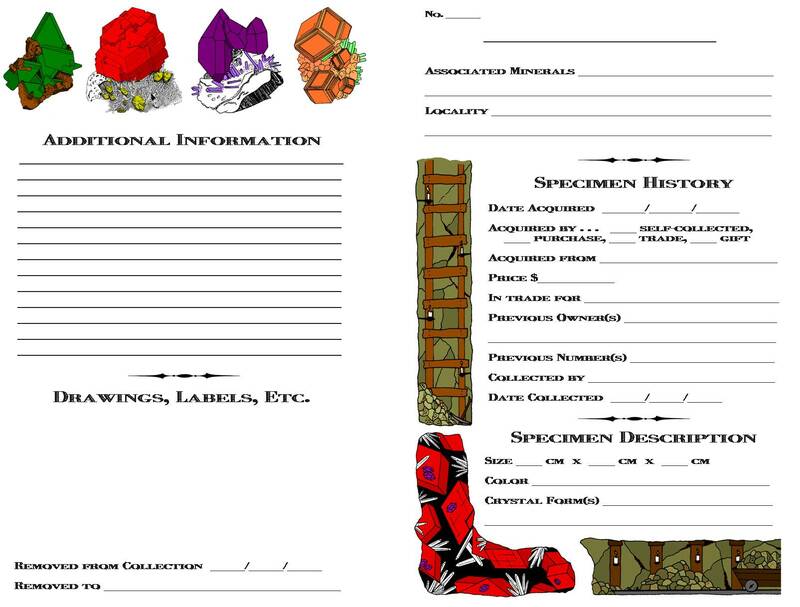 When you add a specimen to your collection, you must write down (or, keep a computerized record) the three W’s: What, where and who. What is the specimen? If it is calcite, record “Calcite.” But if it is calcite with amethyst and pyrite, record “Calcite on Amethyst with Pyrite” or “Calcite and Pyrite on Amethyst” or whatever is the best description of the specimen. Who? There are two “who’s” that are important to record. The first is who collected the specimen. This piece of information is one of the hardest to get, especially if you are purchasing a specimen at a show. The second is who has owned this specimen in the course of its history. Look at the picture to the right that has had an interesting history. It is a large smoky quartz crystal from Gotthard, Switzerland. It was owned by Dr. F. Muehlethaler who was from Switzerland and lived from 1868 to 1920. By the end of the 1900’s it was owned by Dr. Albert L. Kidwell (after whom the mineral Kidwellite was named). After his death, this specimen ended up in the hands of mineral dealers, Donald and Gloria Olson. They sold it to Darryl Powell who owns it today. If you have a specimen that once belonged to James Dwight Dana or George Friedrich Kunz, you have something that could be worth tens or hundreds of dollars more than the specimen would be worth by itself. But you would need the old label with the specimen to prove that the specimen belonged to a well-known and important mineral collector. Some day you may wish to sell some or all of your collection. When you do, you can get more money for the specimens if you have as much information about them and their histories as possible. Other information worth recording . . .
You don’t have to keep information about a mineral that is easily found in a mineral book. Its chemical formula, for example, is easy to find on line or in a book. The crystal system is also basic information that is easy to find. However, there are some special pieces of information that would be worth recording. Here is a brief list. Crystal Form Some minerals can be found in different crystal forms. Pyrite is a great example. Most collectors know it crystallizes in the cubic or isometric system. However, your specimen might be a simple cube. Maybe it’s a pyritohedron. Maybe it’s a combination of a cube and an octahedra. Maybe it’s a cube and a dodecahedron. This detailed information helps identify your unique specimen. Color especially if the color is particularly interesting or unique for the mineral species. Any stories or history behind the specimen Just for the fun of it, here’s a story that goes with a sphalerite specimen from my collection. Its collector and original owner was a college professor, A.B. Krom. The story goes that quite unfortunately, Mr. Krom was in the country of Cuba at the time that Fidel Castro and his army took over that country. A native Cuban found Mr. Krom and greeted him with, “Raul?” Raul is Fidel Castro’s brother. Mr. Krom’s new Cuban “friend” thought he was Raul and smuggled him out of Cuba to safety. Of course, Raul Castro stayed in Cuba with his brother, Fidel, and the other soldiers. Today, Raul Castro is the President of Cuba. I haven’t been able to verify if this story is true. It was told by a “friend of Mr. Krom’s.” But it is an interesting tale! 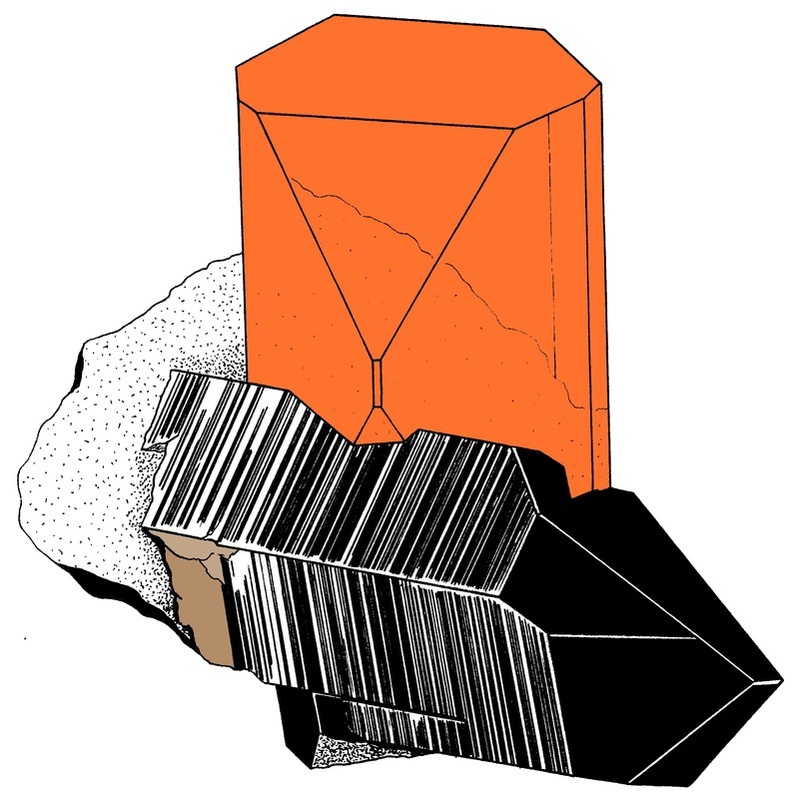 Click the item to the right and you can download a page that you can use to make a catalog of your mineral collection. It is 5 1/2 x 8 1/2 inches in size. Print one side of a piece of paper and then print the back side. Cut the page down the middle and you will have two complete catalog pages. Some of us old folks still like the idea of hand writing our collection catalog information. It feels more personal for some reason. However, most collectors, and certainly all museums, use a computerized system. Ed’s DB V3 www.gemlite.com.au/software This is another professional cataloging program with a lot of flexibility. Minerals www.carlesmillan.cat/min/main.php Free software for cataloging mineral collections. GneissWare Mineral Catalog www.bobgriffis.com/gneissware/index.php This software is very useful. The website indicates there is a limitation with the thumbnail picture feature for the Vista operating system. $49 as of December 10, 2012.